Explore all the features of Elfsight Google Maps and how they can help you create the most effective widget. 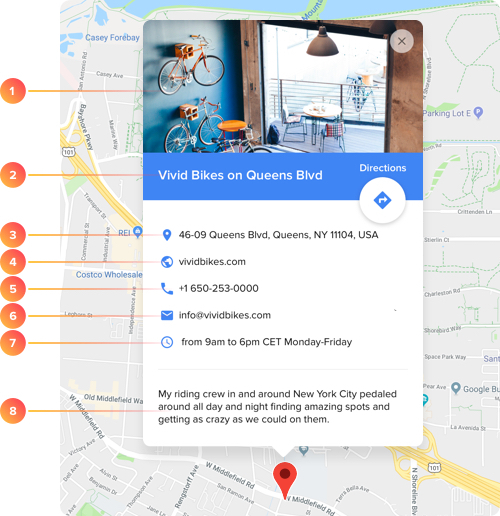 Make it easier for your real-life visitors to contact you – Elfsight Google Maps location widget info card can show detailed contact information: address, phone number, email, website, and your working hours. You can add a picture and choose animation style to show the card on hover. If you have multiple offices or departments, you can not only mark them on the map, but compile a list that will be shown as a side panel. Give it your custom title, show or hide image and contact info, such as address, phone and working hours. If you feel no need in the location panel, you can simply switch it off. 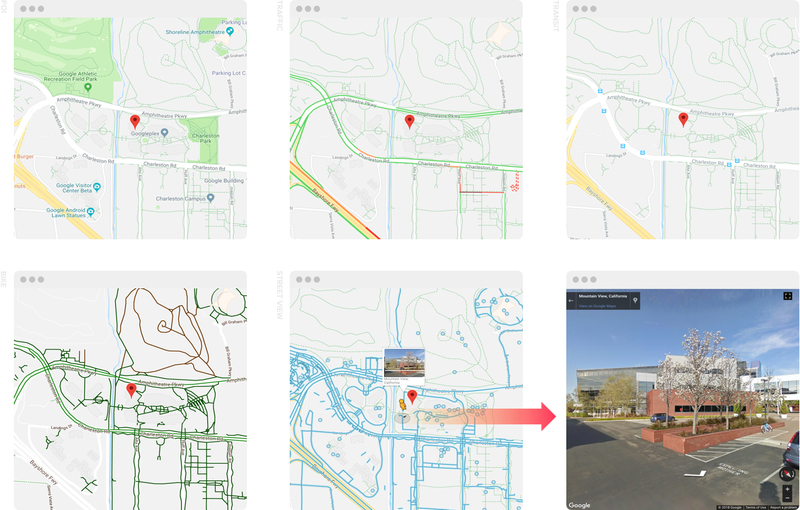 See a selection of real examples to explore the full potential of Google Maps for your website. Try all the features of Google Maps in live demo now. No fees. No registration. No coding. Shape your map so that it is not only easy and clear to navigate, but also interactive. You can add an unlimited number of markers to your map: stores, restaurants, public places and parks – choose from a library of 50+ categories, each with its own icon. Let your visitors know what is nearby and make their way to you comfortable. 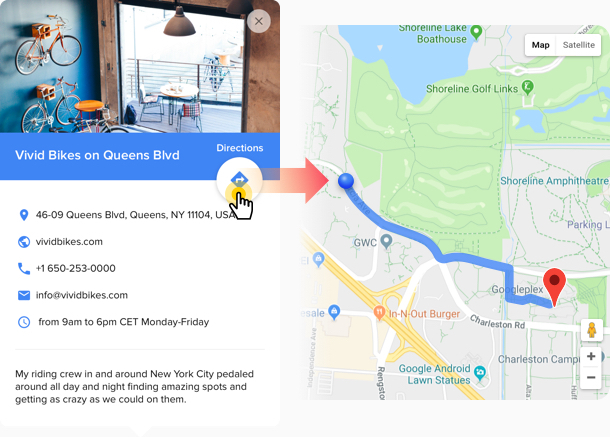 Help your website visitors become real-life ones with handy route calculation right on the page. Switch on Directions on your info cards, and on a click your user will see automatically calculated routes from his locations to yours. 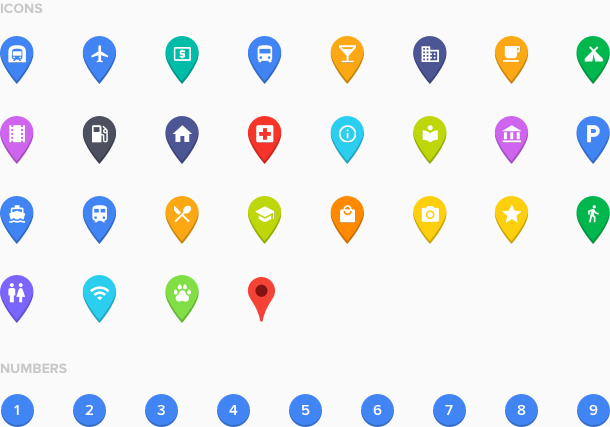 All the options of Google Maps directions widget available without leaving your page. You no longer need to know the geographical coordinates of an object to mark it on the map. Elfsight Google Map location widget allows for easy search by only address. Simply start typing the physical address of the needed map location and the map will come up with suggestions that you can click to choose. 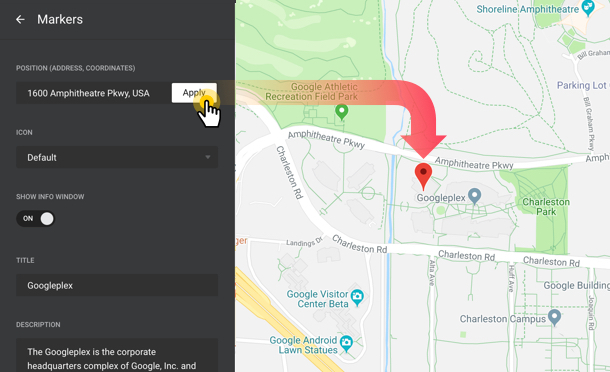 You can make your map really clear and helpful for your clients using Google Maps settings available right on the widget. Choose one of the layers: Transit will show public transport routes and stops; Bike layer will be helpful for cycling-lovers; Traffic is popular among those who drive. Tip: Streetview will help your customers check the place to get to know it better in advance and not to get lost. All the handy options of Google Maps are available to you right there on your website. Choose the map type: roadmap, satellite or terrain. You can set any types of control out of six available, including zoom, scale, rotate, fullscreen and more. Enable or disable dragging and scroll to scale. You are free to set any proportions of the widget. Depending on your website space requirements, adjust the size of the map in a couple of clicks. Our widget is also mobile optimized and it will adapt the layout to the size of the screen, so that it looks balanced on any type of device your clients may use. Tip: Avoid decreasing the size of the map, make it big enough for your visitors. The map should look clear and distinct on the page, so that your clients will easily view it and navigate. 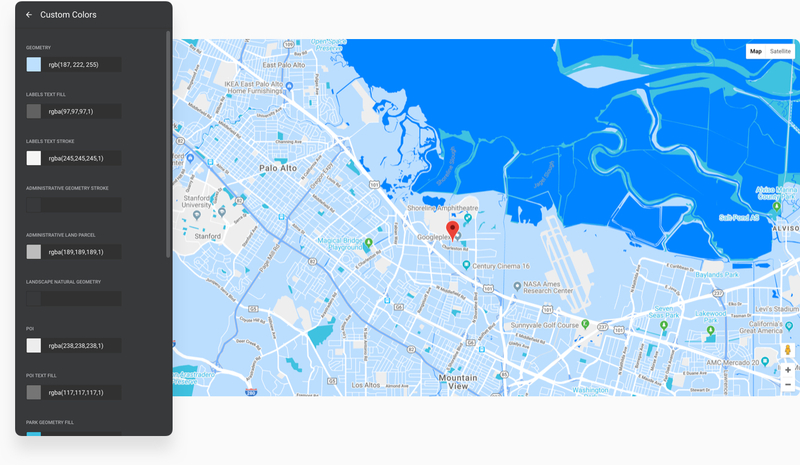 Elfsight Google Maps website widget has developed four stylish color schemes for your map. Featuring Silver, Retro, Night and Custom styles, it allows to adapt your map to the general concept of your website and achieve visual balance on the page. There are endless possibilities for those who want to make a really unique map. Give a custom color to any element – labels, geometry, landscape objects – all in all 23 elements are paintable. Color the map any way, it’s only your imagination that can stop you.